The Pacific Northwest business community has been on fire lately with many industries reporting rapid growth. But in some cases, it’s not just rapid growth, but sustained growth that counts. So, we are over the moon to announce that Kinesis has been recognized for our steady progress: we’ve ranked in the Portland’s Business Journal (PBJ)’s Top 100 Fastest Growing Companies for the fifth year in a row, earning us the elite Lighthouse Award! We’re also thrilled beyond measure that four of our clients also made the list: Pacific Energy Concepts (for four years running! ), 3J Consulting (three times), Fusion (twice), and SingleMind Consulting. We extend a huge congrats to these companies. Kinesis’ clients are truly remarkable! Our growth rate over the past five years has allowed us to expand our staff and welcome more clients. Yet, as quickly as we’re evolving, we continue to recognize the importance of sticking to our core values and cultivating a culture with purpose. Below is an interview I conducted with my business partner and CEO Shawn Busse about growing Kinesis over the last 5 years. Q: Sustained growth over a five-year period is incredibly challenging. To what do you attribute Kinesis’ success in this endeavor? A: Building a business that is attractive and healthy. We are healthy in terms of profits, with a stable, satisfied employee base and happy, long-term customers. Our X factor is employee and client retention. Kinesis practices what we preach in our Marketing from the Inside Out™ philosophy: we market to both our internal and external customers, set goals, review KPIs vigilantly, and reward performance. I believe that when you hire great people and then treat them well with engaging work and great benefits, they give back to you in a meaningful way and engage in win-win dialogues. On the other hand, when a company is only focused on making as much money as possible with growth whatever the cost, then all that stuff gets lost. Over time, the company starts to fall apart. These businesses pay a big price because they start to lose their key employees. Q: I think that’s important for people to know that growing a company is a wild ride. Kinesis almost went belly-up in the Great Recession. How did get the company to overcome that challenge? A: Our business had totally tanked. We were running a skeleton crew, and we weren’t paying ourselves salaries. I can remember periodically picking up the phone to see if it still had a dial tone because it simply stopped ringing. At the time, we took a few steps back to look at our offerings and how we were serving our clients. As a result of that pressure, we built a new and better business model. We shifted from a one-off project shop to a company that brings ongoing value to clients, as their outsourced strategic business advisors and marketing firm. Kinesis identified a clear right-fit client who is ambitious and wants to grow and thrive, and we found a way to help them figure out a custom solution to their needs. Most marketing firms (and many other professional services businesses) have a model is that is structured to sell and resell something they’ve done over and over again – such as advertising, pay-per-click services, web design, and so on. There is a lot of customer churn in this model. And, we didn’t want to do that anymore – not only was it risky during times of market fluctuation, but a prescriptive approach to serving clients didn’t align with our values. What we do now is based on our proprietary process of Marketing from the Inside Out™, but it varies from client to client based on their performance goals and Big Vision. Kinesis works with clients on a long-term basis and our team adds continuous value to their companies. Q: In your interview two years ago, you mentioned Blue Ocean Strategy as a book that influenced your strategic decision making. Any other books that have been influential? A: Well, of course there is Jim Collins’ Good to Great and getting the right people on the bus, and then in the right seats. He says that leaders of companies who go from good to great start with the “Who.” As we’ve grown, that becomes increasingly meaningful. Having a rigorous, disciplined hiring process that attracts and selects the right people has been critical to our success. 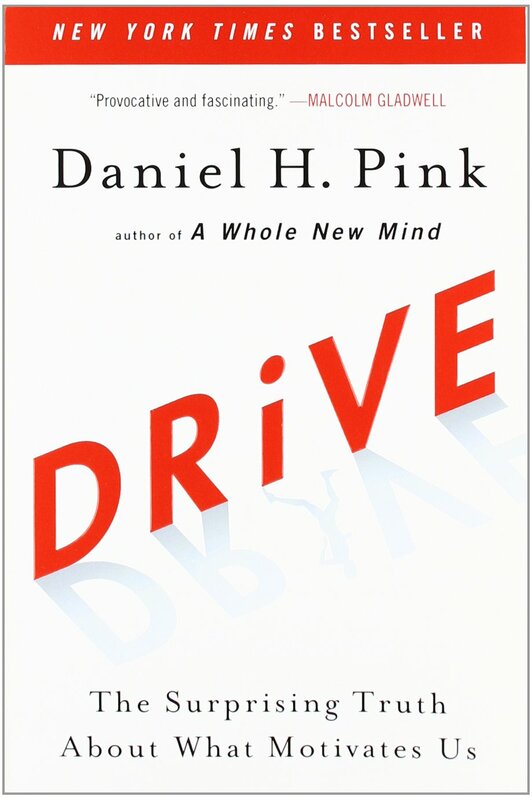 Another long-time favorite of mine is Daniel Pink’s Drive. He talks about autonomy, mastery, and purpose as the keys to truly motivating people. I spend an incredible amount of time guiding, coaching, and mentoring our employees. I want to ensure our people are fulfilled in what they are doing – when this piece is in place, the ROI is incredible. Happy employees who have purpose deliver amazing service and are incredibly productive. A more recent one is Give and Take by Adam Grant. He defines three types of people: givers (people who give without expectation of their gesture being returned), takers (people just out for themselves), and matchers (people who expect that when they give another person something, they’ll get something in return). What’s interesting about the research is that the givers actually outperform the other groups long term – whether it’s career advancement or a company’s success. In terms of my leadership style, my employees, and our clients, I always strive to be a giver. If I’m in the position to help somebody, I will (even if it doesn’t result in compensation for me or get someone to return the favor at a later date). Paradoxically, this has opened up tremendous opportunities for me and for Kinesis, even though that’s never been my expectation. This includes introductions to new business opportunities, new employees who I never realized could be employees, and best practice shares that have become competitive advantages to our business. Note: Want to see all our favorite business books? We have a Kinesis Reading List for that! Q: You have a large network of business owners who aren’t clients. Peers, mentors, and so on. How has this helped you lead the company? A: It’s helped tremendously. As I get older and further along in my career, I realize the one thing I can’t apply money to is time – no one can buy more time. Once I realized that’s the most finite commodity I have, I decided I wanted to spend my time doing things that are meaningful and important and filled with purpose. So, learning from other people has been critical – it’s a leap frog move. Instead of blazing the trail every time the company tries to do something, I reach out to my network to find out if someone else has already been down the trail before me. Usually someone has and can give me great advice. This has given back to me in incalculable ways. By cultivating a large network of business leaders and owners, I can ask my network any question I want. Through those relationships, I’m able to get a broader perspective. There’s no reason to reinvent the wheel. Q: You’ve said before that you’re a big believer in marathons over sprints. If you were speaking to a company interested in pursuing the Lighthouse Award, would you still give this same advice? This approach has served us really well. Our company growth rate year over year hovers between 20 and 30 percent. The tempo, rhythm, and heartbeat of Kinesis has stayed roughly consistent over the years. In contrast, growing insanely fast over a year or two is a little like drinking way too much, in that your business gets sick and has a terrible hangover. I’ve watched countless companies achieve a massive year of revenue growth without the systems and processes to support it – the result is a decrease in service: customers leaving, and employees becoming burned out. If you’re looking to create a purpose-driven company with a great work environment where people smile and enjoy the work that they do, focusing on the long term is more important. That’s the marathon. What’s next for Kinesis? What’s the next marathon you want to run? Growth makes room for more A-Player employees. That’s a big part of why growth has been so important to us. I want to hire remarkable people who want to do remarkable things. We became a B-Corp last year. Their certification looks at metrics like employee engagement, employee tenure, customer engagement, support for local community, giving back, and so on. That’s what I’m thinking more about now. I want to achieve recognition as an Oregon Best Place to Work and maybe one day as a national Great Place to Work – It’s not because we simply want the award, but because in order to be recognized you have to have a fantastic culture with career growth opportunities. It’s really about what we create in our company in order to get there, and what that can sustain. Growth is an outcome. It is not a guiding light. Achieving that outcome is about doing a lot of things correctly: right-fit customers, right business model, great employees, high retention, smart messaging, and ongoing marketing. It’s like climbing Mt. Everest. To succeed, you have to spend years prepping and training and getting the right gear and the right support team. Growing a business is no different. Training, conditioning, right team, right equipment – that’s where the focus needs to be, and growth will follow.